(Newser) – Forty years after Watergate, Carl Bernstein and Bob Woodward assess the man their reporting forced from office, and the headline in the Washington Post sums it up: Richard Nixon, it declares, "was far worse than we thought." 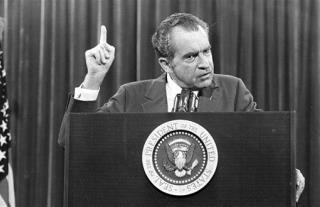 Forget the popular notion that the burglary itself was a minor thing and that the coverup actually brought down Nixon. That lets him off too easy, they write, and "minimizes the scale and reach of Nixon's criminal actions." I've been meaning to read Fear and Loathing on the Campaign trail for some time. Just think of it. If had only committed war crimes, he would have been able to finish his Presidency.